Here's hoping that all of you that celebrate Thanksgiving had a wonderful gathering with friends/family! Today I'm sharing a mini album that I made a few months ago with the use of Authentique's 'Legacy' collection. I call this mini a 'Tri-Fold Mini Album'. It's a relatively simple album to make but provides the access to store several pictures, journaling & even a sentiment if so desired. These pictures of me & my son were taken this past Mother's Day. I loved all the different action shots & wanted to showcase them in a quick & simple way. 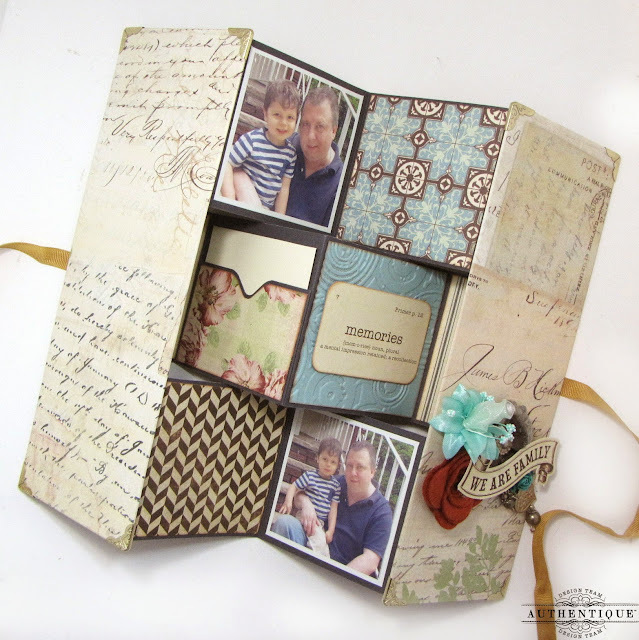 While navigating through Pinterest, I found a tutorial for this sort of mini album. I'll supply the list to this tutorial at the end of the post as well as a brief video showcasing this mini. The tutorial is in French--but luckily with the help of 3 years of French taken at college & the photos provided in the tutorial I was able to easily create this mini. What I liked the most about this mini is that you can either store it closed or display it on a desk or shelf standing up as shown in this screen shot. I have my mini album displaying on my desk at work. So this mini also makes for a nice keepsake or gift. 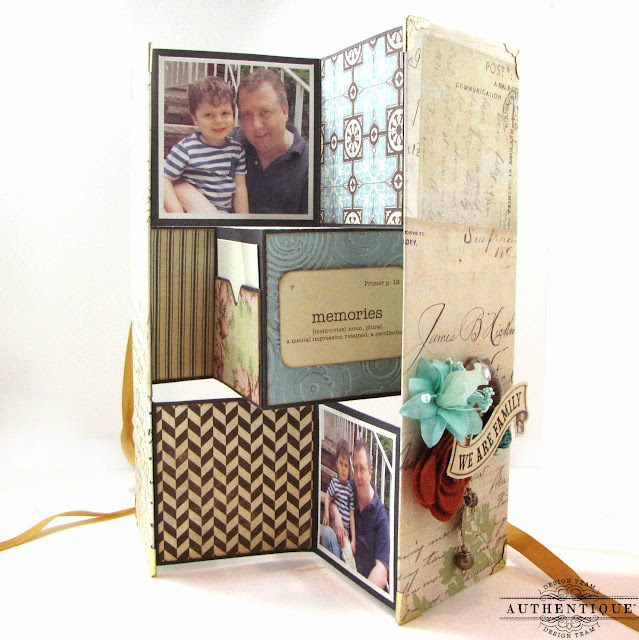 The photo shown here is of the back of the mini where I've included two photos of my son & husband along with 1 pocket to store journaling and 1 sentiment. 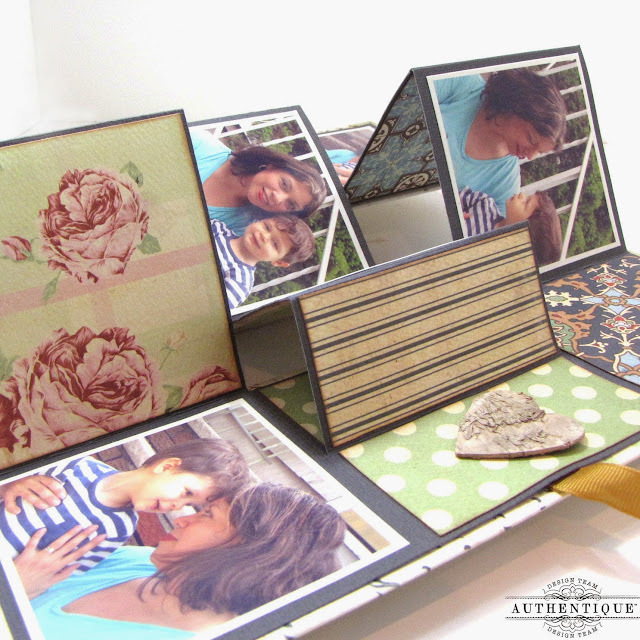 This mini is designed to hold 8+ photos--depending on your needs/preferences. Each square measures 3" inches x 3" inches--so the photos measure about 2 3/4" inches x 2 3/4" inches. The album itself measures 3 1/4" inches wide by 9" 1/4" inches high & it has medium chipboard covers. For those of you that are saavy with the paper & scissors--here's the link to the tutorial. For those of you that are not too savvy with the paper & scissors--I'm offering to make this mini in my Etsy shop 'The Kraft Nook'. I don't usually make this sort of offer because I don't have sufficient time to create made to order albums or altered projects. However, I found this mini simple & quick enough to make that I feel I can squeeze it into a typical busy week. It can be made in any theme--if interested, just send me a message via Etsy & we can discuss the design of the mini. Here's a video showcasing the mini. Your album is terrific! I didn't see where the link to the French tutorial is? Thank you! Your beautiful album has inspired me to create an album an album! Your son is adorable. He looks well loved!